Are you owned by a cat or 2 or 3 or more? Then I bet you are wondering--National Cat Day? I thought that was every single day of the year!! Ask any cat--they will agree with that sentiment, and proceed to convince you of that fact if by some odd chance you don't. Just like their human companions each cat has a personality all their own. Baby, my current supervisor, can get downright persistent in her training methods. And you better believe I hop to it when she meows--and if I don't--she patiently does NOT LET ME DO ANYTHING ELSE until I do her bidding. We have had many arguments over the years--only if you are owned by a cat will you understand that. Her wet food has to be changed at around midnight then again at around 5 in the afternoon. She appears from where ever she has been napping or sleeping around an hour before to make sure I am awake. Leaving the apartment am I? Well, I better clean the litter box FIRST or she will manage to stand half in and half out of the door so I can't leave. And don't let me come home after dark!! Her meow can be heard in all the other apartments on my floor--she gets VERY annoyed with me. Now this little diablo (devil/angel) is really quite intelligent. She has figured out how to open all the lower cabinet doors in my kitchen (I've caught her working on the upper ones too). She also figured out how to open the drawers and door to one of my highboys in my bedroom. This one really does not like any door to be closed at any time--I mean who knows what might be hiding in there! I have come home to find all kinds of objects on my kitchen floor--and clothes on my bedroom floor. If there is anything in the way of where she wants to take a nap--well out it goes--with a mighty swipe of her paw. Now I can get a bit ornery when woken up. Thus Baby has figured out how to do this without going near me and my swinging arm. First it was knocking my computer down--so now it lies flat on my desk. Then it was banging pictures against the wall in my bedroom. The neighbors started complaining--so I took them down. So what does she do now? SHE TURNS ON MY DESK LAMP-and waits until the light shining directly in my eyes wakes me up. She sometimes, at night, will sit there right next to that lamp and threaten me with it. I have more or less learned to sleep with the light on now. In the evening if she wants total attention, she will go into the other room and meow piteously as if something is wrong. Ever heard of the boy who cried wolf one too many times? Well now she has a new one--she will grab a bag that I inadvertently left on the dining room table and move it either to the floor or right into my bedroom. While she is doing this--her meows sound like "come quickly--something is wrong" a very worried and loud meow. Not all cats are vocal--but mine sure is. Bedtime around here is no later then 8 pm. Once I get into bed she hops up kneads my legs while I pet her. Of course if I get up and go into the kitchen for a drink of water--she is right there and if I am lucky she will just kind of herd me back to bed--if unlucky-she gently nips the back of my leg as if to say--hurry up--I left you in bed and you better get back in there-pronto. Of course she has her very gentle side as well. When I cough a certain way at night--she is right there checking to make sure I am breathing. And she did save me from drowning in the bathtub that day I totally dehydrated. With her paws on the side of the tub she meowed for all she was worth until I got up and out! She absolutely loves to be petted for extended periods of time. Her favorite spot is under her chin or the sides of her face. She also tolerates when I pick her up to cuddle a bit or move her from where ever she is meowing like she is the most unloved cat in the world-to my bedroom. So, do I love her? With all my heart. So at least here--in my apartment National Cat Day is not needed--it is every day. But I often think of all those kitties who either live in shelters or on the streets. And it is for them that National Cat Day was created and means a lot! We lost our cat about 2 years ago and for the first time in many years, we have no pets. 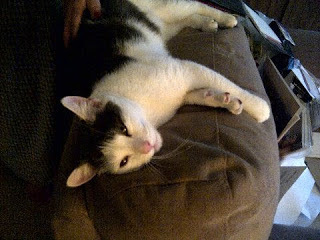 There is definitely a void in our home and once my little guy starts preschool we my try for another kitty or pup. I am owned by 5 cats. Five felines each with incredibly unique - and strong- personalities! My two youngest are like toddlers! You're right, every day is cat day according to them! All cats sure do have their unique individual personality. My son that lives in my upstairs apartment has an adorable 9 month old tiger cat. She tries to visit me but Buddy my German Shepherd - Chow won't hear of it. Not that you think it's great but I am amused at your cat turning on your desk lamp or threatening you with it. What a little stinker. As for kittens at the shelter, my opinion is that if people took responsibility for their animals the problem wouldn't be so big. Our precious Peaches was spade as a kitten and stayed with us til she passed as will this one, which has already been spade. Such a beautiful cat! They are so beyond smart. We don't currently have one but my little girl is working on her Daddy. Maybe for Christmas! 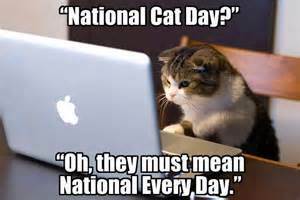 I had no idea that there was such a thing as National Cat Day, but I guess I should have considering there seems to be a National Day for everything these days! Your stories are SO relatable! We've had cats my whole life and I can't imagine anything differently. They add personality to the family! What a sweet relationship you have with your kitties!! Happy Daily Cat Love to you! I love cats but am highly allergic and am a huge admirer from afar! I don't have a cat so I really don't know much about cat. Nevertheless, Happy Belated National Cat Day! We have so many special days out there and a national cat day is quiet amazing as I love them so much for their cuteness. Your little diablo looks cute as well and I love all the fun involved with it in your home. I saw everyone sharing the love for their fur babies over the weekend. So cute! I had no idea that there was a special day for cats! I think it's a great idea to give some extra attention to our furry friends. We don't have a cat, but my husband and daughter are huge cat friends. 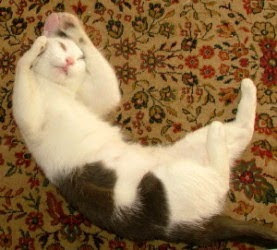 I absolutely love cats and would have a few of them if I wasn't allergic to them. They are such independent animals and can also be very affectionate at the same time.